The relationship between faith and works is an oft debated topic in Christendom. My own understanding is that our good works do not save us. Strictly speaking, our faith doesn't save us either. But if we have faith in the Savior, we will be saved. However, if we do not good works (by keeping His commandments) we cannot truly say we have faith. James' words mean, in essence, that "faith without works is not faith," or "there is no such thing as faith without works." One useful parable to illustrate this point is to think of two men lost at sea, far from any land. They pray to be rescued from drowning, and a ship happens to pass by and sees them. Those on board throw life preservers to the men. One of them grabs the preserver and is pulled to safety. 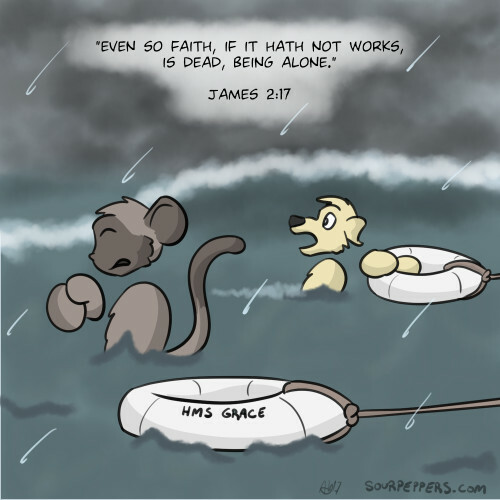 The other however continues to pray rather than grabbing the preserver, claiming that he will be saved because he believes that those on the ship can save him. It is, admittedly, not a perfect analogy, but I think it illustrates the important points. While the first man couldn't truthfully say to have saved himself, grabbing the preserver was required for him to be rescued. The second man could have been saved as well, but merely believing in the ability of the rescuers to save him wasn't sufficient. We do not save ourselves by performing good works. To claim otherwise would be even more ridiculous than the first man claiming to have saved his own life. But we must do more than profess belief. Our Savior's grace is available to all; we have only to reach out.